In India, there are a lot of services to send free SMS online. Most of these services generate revenue through Ads. A small part of the 160 character message is reserved for advertisements. This is similar to other advertisement businesses like Google Adsense. However, there are few other websites which allow use of full 160 characters and do not add any other content to your SMS. 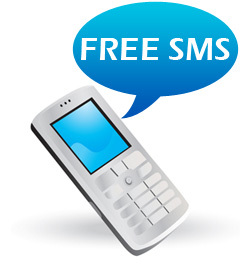 I am list 5 best websites offering free SMS to India without advertisements. When this service started back in 2008, as its name suggests, it offered free SMS in India. The business was completely based on Ad revenue and the strategy was to utilise 50% of the 160 characters SMS to display advertisement. 160by2 has recently changed their strategy. It is not clear how they generate revenue right now however they provide free SMS which are completely Ad free. You can send one SMS at a time. One of the oldest free SMS service without any ads. Allows maximum 160 characters in one SMS. Provides lots of other options like Group SMS, Reminders, Scheduled SMS, etc. The most unique feature freesms8 provides is the Dynamic sender Id. You can use your name as your sender ID instead of your Mobile Number. SMS440 claims that they are world’s first & only free SMS service providers to allow up to 440 character long SMS without advertisements. Other features include SMS in multiple languages with real time language conversion, Group SMS, Schedule SMS, etc. This site lets you send SMS as big as 500 characters without Ads. Best thing about this site is, it does not require user registration or login. It does not take the sender phone no. Only issue being it registers the sender IP address in case there is any illegal activity. This is the last site in my review. Whozzat provides enterprise communication services to its clients. They also provide free SMS service to registered users. One can send up to 150 SMS each day, each SMS being up to 470 characters long. couple of good feature i see on the list are, you get delivery reports for you SMS and you can sync your phonebook with a phone. Most of the above mentioned services provide basic ad free SMS service limited to India. 1st 2 unlimited SMS per day but each SMS is limited to 16 characters. Rest all allow more than 400 character long unlimited SMS per day, except Whozzat.com which has a cap of 150 SMS per day. I feel Whozzat.com is the best provider in this list as it gives all the services provided by other services, 470 characters is a descent size for an SMS and for personal use 150 SMS per day are more than enough. Whats more, it also gives you delivery reports for each SMS sent which is not provided by any other website. Some of these websites also provide mobile applications (Android or iOS apps), which can be used to send free SMS from s GPRS or 3G enabled phone or tablet. If you know of any other services to add to this list or know a better website providing better features than the ones listed above, feel free and leave you comments in the section below. You can also send Free Unlimited SMS to over 200 countries using the site below. You can send Free SMS to any country in the World at any language you want. It is the best Free SMS site I ever used and tried. Now days who are using free sms? I think everyone using internet on their phone hence whatsapp and other messenger are being used.